There are also other features and methods to analyze data that allow you to gain even more insight into your accounts, campaigns and even ad groups. I’m going to review some more essential paid search metrics that matter to PPC. Based on Google’s Lost Impression Share metrics, we can determine how many impressions were lost strictly due to budget constraints and poor ad rank. We can also see exact match impression share, which eliminates uncertainty due to Google’s keyword-query matching for broad and phrase match keywords. With these impression share statistics, we can estimate our clicks, cost, and conversions if we had received those lost impressions. Available at the campaign and ad group levels, this metric provides opportunity for optimization by showing that we accomplished X, we could accomplish Y, and we need Z to get there. Read Francis’ blog to learn more about how to show clients they are missing potential leads and/or profits. This simple calculation will show how much revenue was received for every dollar spent toward advertising. This metric differs from ROI ( [revenue – ad spend] / ad spend) and remains an easy way to measure the value and effectiveness of PPC campaigns. The breakeven point for ROAS is $1:1 or 100%, meaning that $1 in revenue is generated for every dollar spent on advertising spend alone (not taking into account agency fees, product costs, etc). The higher the ROAS, the greater return you’ll see! At Seer, we calculate this metric to further analyze ad copy if there is a discrepancy between using conversion rate and click-through rate to determine which version of the ad is the “winner.” For instance, if ad 1 has a higher click-through rate but ad 2 has a higher conversion rate, we would then look at which ad has the higher CPI to help make decisions about which ad wins. Take this even one step further and consider calculating Profit per Impression to bring revenue into the equation. The last two metrics I’m going to discuss relate to Google Ads Call Metrics. 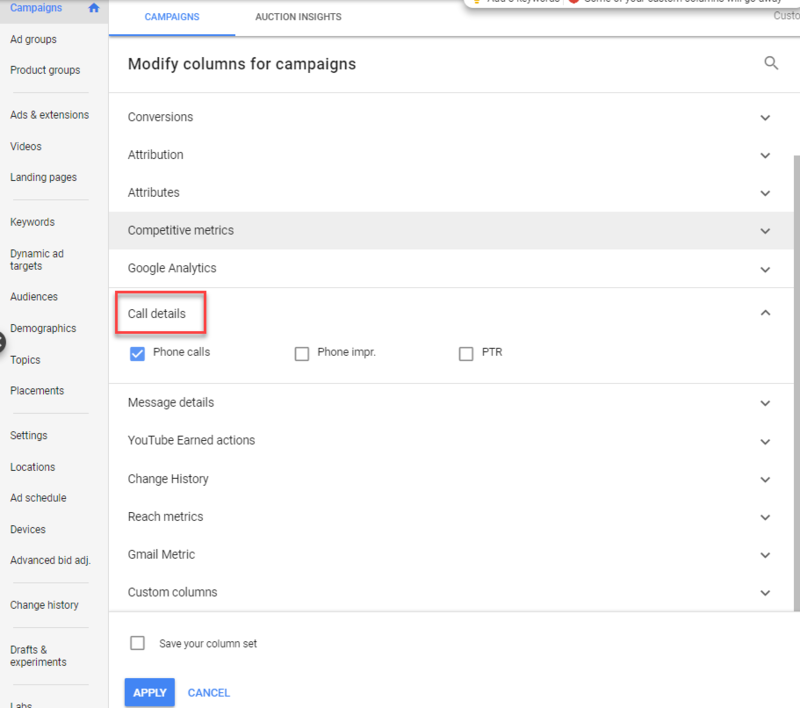 Almost a year ago, Google Ads released a bid-per-call feature that not only affects Google ad position and quality score, but it also allows advertisers to capture offline actions in addition to online actions. Using call extensions assigns a unique phone number to your campaigns/ad groups that will appear as an additional line of ad text. When a prospective customer calls that corresponding number, the call will be forwarded to your business while Google Ads records call data. As shown below, this data can be accessed from the Campaign and/or Ad Groups tabs, as well as the Dimensions tab. Similar to CTR, this metric tells you the total number of phone calls received from ad X relative to the total number of times ad X was displayed. This can be analyzed just as you would look at CTR: the higher the CTR, the better performing the ad. However, it is important to note that just because an ad may have a higher PTR (or CTR), does not mean that ad is generating the most conversions or revenue. 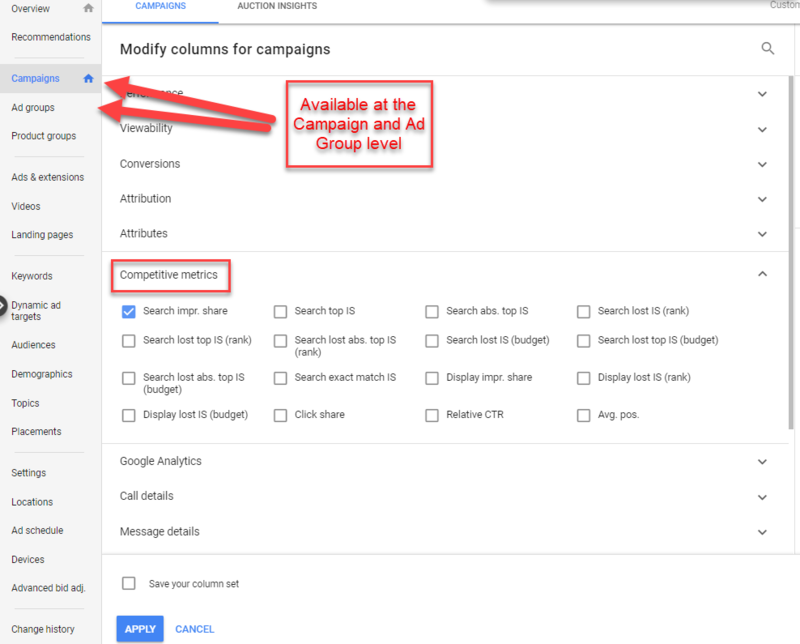 It may be beneficial to keep an eye on PTR, CTR and ad copy when analyzing call metrics performance as well because as you may start to see trends in which ad copy tends to perform better in different scenarios. For instance, if an ad is using call metrics and it has an awesome CTR but PTR isn’t so hot, it may make sense to reevaluate your call metrics strategy. Similar to Avg. CPC, this metric tells you the average cost you’re paying per call. Because the majority of calls are $1.00 and because you are only charged when the number displayed in the ad is called, using call extensions may actually result in cheaper CPAs. You can specify your Max CPP on the Ad Groups tab, where you’ll notice that the minimum fee is $1.00. When setting your Max CPP, it will be helpful to think about whether a click or a call is more likely to convert for your business/industry. If phone leads tend to be better quality or consumers further along in the conversion funnel, you may be more willing to bid higher for phone calls. Also, if your business/industry is highly seasonal, higher bids may make sense during the busy season to ensure visibility. Although these call metrics are separately broken out in Google Ads, it may be helpful to add online leads/conversions with phone leads/conversions to find total CPA, Conversion Rate, etc. to help you see the full effect of your PPC efforts. Now that you know 5 more essential PPC metrics, be sure to share your favorite PPC metrics in the comments below!